Myanmar and Korea are different in many ways but they both share a longing for peace. In the 70 years since it gained independence from Britain in 1948, peace among ethnic groups has eluded Myanmar. Since the 1950s, when an uneasy truce was reached between north and south Koreas, peaceful reunification of the peninsula has as yet proved impossible. Myanmar and Korea’s shared desire for peace is on display in an exhibition showcasing works of pacifism from the two countries at New Treasure Art Gallery on Thalwin Street, Golden Hill Avenue in Yangon’s Bahan Township. 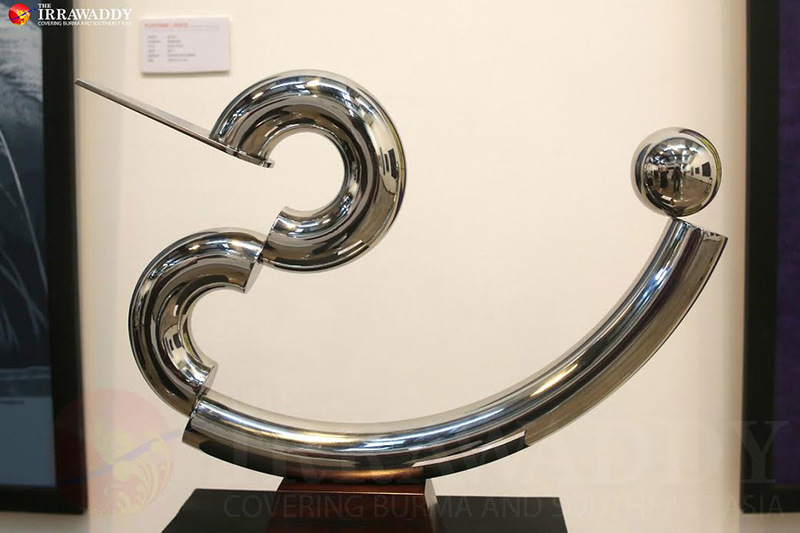 The exhibition titled “Platform of Peace” is the second edition of the Korea-Myanmar art exhibition and features works by ten Myanmar and ten Korean artists and sculptors. Over 40 works by Korean and Myanmar artists are on display at the exhibition, which continues until Thursday. The first edition was held in 2015 to mark the 40th anniversary of diplomatic ties between Myanmar and South Korea. Myanmar artist Moe Nyo sugested there should be more similar exhibitions. “For many people living here it will be very beneficial,” he said. 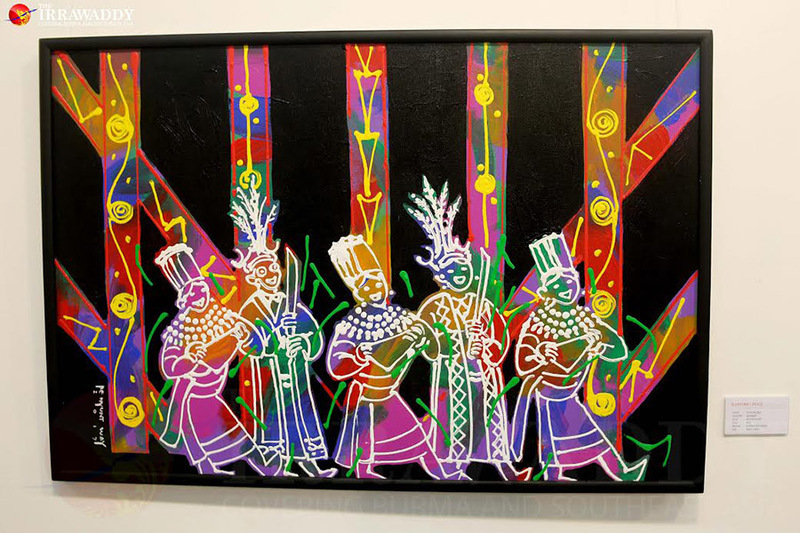 Myanmar artist Pe Nyint Wai showcases two paintings exploring unity and friendship—one shows a traditional Manaw dance of the ethnic Kachin People and another depicts people playing with Myanmar’s traditional cane ball. 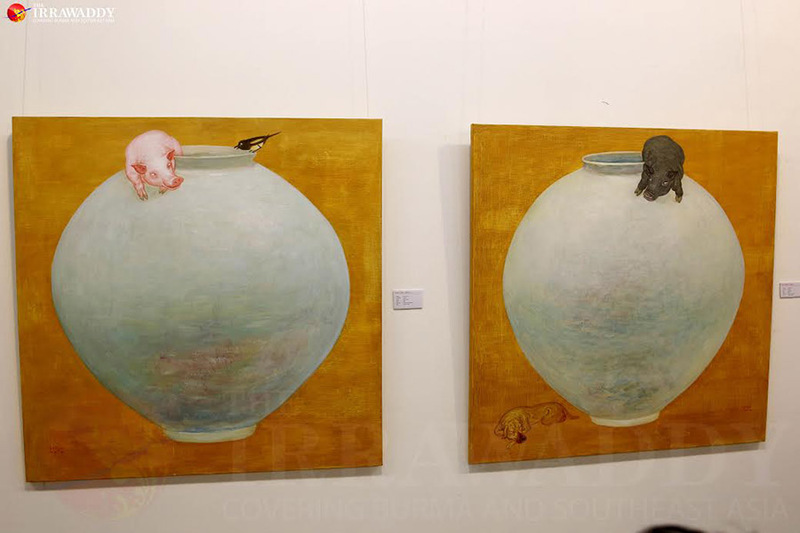 Another highlight is Korean artist Choi Sukun’s painting titled “Old Jar” featuring a dog and a pig. He told The Irrawaddy that traditional circular jars remind him of the moon and the moon’s cold light gives a sense of peace. 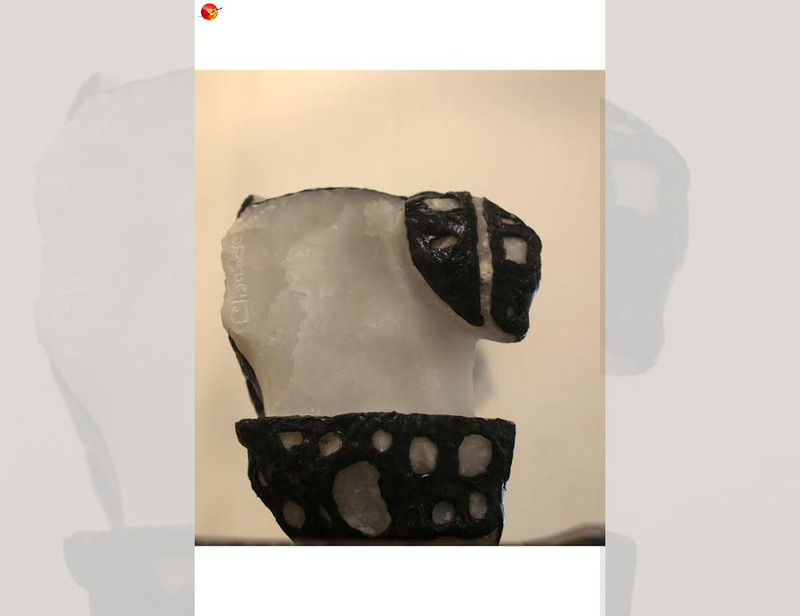 Works on display at the exhibition are priced between US$100 and $3,000 with 50 percent of the proceeds being used to repair schools and roads in Myanmar through Artistic Asia, according to exhibition organizer of Min Wai Aung.